DJI S800 EVO 1552 Foldable Propeller Upgrade Pair. 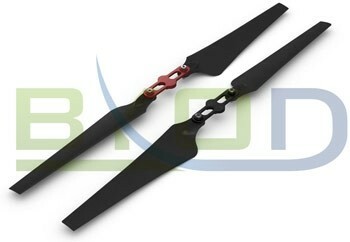 The latest folding propeller design for the S800 EVO, These will not work the S800, they will only work with the EVO. The 1552 foldable propellers have a new advanced aerofoil design and are constructed from stronger materials which gives these 1552 propellers a 10% efficiency increase when used on the S800 EVO. This is a pair of 1552 folding propellers for the Evo they are supplied without propeller brackets. It is recommended to apply a small paint mark on the screws after installing the new propellers, this allows a quick look at the the new S800 Evo 1552 propellers security, if the paint is un-broken they are not coming lose, the propellers should move with a small amount of resistance when installed, if they are not free to move this will cause vibrations in the arms. 1 x CCW 1 x CW Propeller. Size: 15 x 5.2 inch. Working temperature: -15c to 45c.